Symbols of the Temple depicted in the mosaic floor of the 4th century CE synagogue at Hamat Tveriya, just south of modern Tiberius. Steam rose from the open drain next to the sidewalk where we stood. My class from Pardes Institute was at Hamat T’veriya, listening to Leah Rosenthal review the Talmudic discussion about the use of hot water on Shabbat. Is it permissible to warm food with steaming water from such a spring on Shabbat? Is it permissible to bathe in a hot spring? Well, it depends…. Behind her, steam rose from chimneys built into the ground. Hamat, or Hot Place as it was originally called, sits at the southern end of the modern city of Tiberias. It’s near the southern end of the Kinneret (Sea of Galilee). The hot springs have drawn people to the area for millennia, and are reason Tiberias is located where it is. If you come here by cab, you have to be sure the driver understands you want to see the archeological area and national park. Most drivers will automatically take you a little further south to the modern installations of Hamat Gader. There, you can indulge in a leisurely soak in the mineral-rich waters that bubble up, pre-heated by geological forces. In 1985, our family had spent a couple hours at the modern hot springs on a synagogue-sponsored trip. It was late December, and we had just passed several cold damp days in Jerusalem. Between the normal Jerusalem winter chill, and the lack of heat almost everywhere, I had often felt like I could never get warm. I was unenthusiastic about putting on a bathing suit and immersing in an outdoor pool. But the building itself was very warm. My youngest child needed close adult supervision. And the steam rising off the indoor and outdoor pools enticed me. The warm water quickly warmed even my cold feet. It was so warm and relaxing, I didn’t feel like swimming—I just wanted to drift near the inlet where the hot water entered the large pool. My son asked me to come to the outdoor pool with him. Standing in the pool was a surprise. The water, heated underground, was hot, but the air above the pool was chilly. I quickly bent my knees to keep as much of my body underwater as possible. I understood the appeal of hot springs, and why Sir Walter in Jane Austen’s Persuasion took his family to Bath. On our trip current to Hamat T’veriya with Pardes, however, we were interested in the hot springs only in passing. We had come to see the remains of a synagogue from the Mishnaic period. Past the chimneys venting underground steam, a side path leads uphill a short distance to a modern shed-like building. It protects a fourth century CE synagogue, which was discovered in 1920. The archeologists who excavated the sanctuary discovered two older synagogues under it. A holy place is a Holy Place. If a particular site was hallowed by house of prayer, then it was only logical to build its replacement on the same site. Visitors are restricted to an elevated platform that runs along two sides of the preserved structure. The remaining walls, about waist high, surround a beautiful mosaic floor. The mosaics follow the same pattern as I’ve seen in other synagogues of the Mishnaic period. Because it was built in the north, the building faces south. A clear glass sheet stands on the south side, where an indentation in the floor indicates the Aron might have stood. “Ve’ahavta l’rayacha camocha” (You shall love your neighbor as yourself) is painted in black letters on the glass. The architectural details of the synagogue, however, are not terribly interesting. The mosaics are the focus of attention. Mosaic floor dedicatory inscriptions in Greek in the synagogue at Hamat T’veriya. On the north side are several inscriptions that sound familiar to anyone who has ever entered a synagogue. One says, in Greek, “May he be remembered for good and for blessing, Profoturos the elder constructed this aisle of the synagogue. Blessing upon him. Amen. Shalom.” Shalom is written in Hebrew. The inscriptions, ancient equivalents of “Dedicated to the memory of Mr. and Mrs. Aaron Cohen,” shows how some things just never change. Closest to the south wall, a row of mosaics depict symbols of the Temple: shofars, trumpets, an incense shovel. The center of this mosaic shows a large menorah, which had become the prime symbol of Judaism. There are no six-pointed stars in the building, or indeed, in any of the early synagogues. Today’s symbol of Judaism, now called the Star of David or Magen David, did not come into common use until the 17th century CE. The most striking mosaic, in the center of the floor, is a large circle, enclosed in a square. On its circumference, the circle is divided into twelve sections, each one portraying a sign of the zodiac, or as they are called in Hebrew, a mazal. The term mazal refers to the belief that one’s sign determines one’s fate in life—a belief borrowed from surrounding cultures. We’ve seen zodiac cycle mosaics in other Byzantine era synagogues. They seem to have been a common decorative motif of the period. The signs of the zodiac are symbolic of the sun’s position in the sky at a particular time of the year. Therefore, it is natural to see some symbolic depiction of the sun in the middle of the zodiac cycle. However, this mosaic seems to go a little too far. In the chariot, which carries the sun through the sky every day, stands not the sun, but the figure of a man. Helios, the sun god, rides his chariot across the synagogue floor? That seems strange to our eyes. Today’s belief in the power of astrology is most likely not the same as it was ancient Israel. Lester Ness postulates that ancient Jews believed that because God created the stars, He controlled their powers. TThe signs of the zodiac were thus visual symbols of God’s power. Jews could not make a picture or a statue of God for their synagogue. Instead, they made mosaics that showed the emissaries through which He worked. In this way, they showed they were both part of the cultures that surrounded them, and also separate from those cultures. Their use of imagery of the zodiac and of Helios symbolized God’s power and control of the world. The synagogue in Hamat T’veriya is an example of how Judaism has changed over the centuries, yet how it has remained the same. It doesn’t matter how God’s power is expressed. It could be through the astrological power He gave the stars, through the ten plagues that led to the Exodus from Egypt, or through the miraculous survival of the Jews through so many centuries. But our belief in one God remains steady. When Uri Savir was growing up in the early 1950s, the area around Kiryat Tivon was largely undeveloped. On Shabbat, when his father did not have to work, the two of them would explore the surrounding hills of the Galil. They collected mushrooms in the forest. Often they walked to the monument to Alexander Zaid, who had founded the Jewish self defense organization, Hashomer, in 1926. In the late winter and early Spring Uri and his father picked the bright red kalaniot (anemones) that grew wild. The hills are pocked with caves. Uri and his father never entered any of them. It was too dangerous —you could get cave fever from exploring a cave. But they would stand at the openings and look in, staring at the sarcophagi inside. In those days, the biggest archeological find was a menorah engraved on one cave entrance. Everyone knew that the menorah was a uniquely Jewish design. Finding it on a burial cave meant that the sarcophagi inside held the remains of Jews. These caves are just outside ancient Beit Shearim, one of the cities where the Rabbis of the late Roman period developed the Mishna. The Mishna, or oral law, is a compilation of Rabbinic discussions and interpretations explaining Torah law. Many of the Tannaim, the sages of the Mishna, were buried in sarcophagi in Beit Shearim. All the burial caves are man-made, carefully dug out of the soft limestone, with alcoves and shelves to hold the deceased. As the vast necropolis was excavated, the graves of many of these Rabbis were identified. The caves had been discovered in 1830, but little archeological work was done then. Benjamin Mazar came and did some excavation from 1936 to 1940. In the 1950s, Nahman Avigad continued the earlier work. By the time Mazar and Avigad started work in Beit Shearim, grave robbers and unscrupulous antiquities dealers had already raided the caves. Nonetheless, it was remarkable how much of historical value still remained. The necropolis has been recognized as a “World Heritage Site” by UNESCO. For this designation, it had to meet two criteria. The first one is that the site demonstrates an interchange of human values, including architecture, technology, monumental arts, town-planning or landscape design. Secondly, the site must offer a unique testimony of a living cultural tradition, or a lost one..
We were touring the Galil with my class from Pardes Institute, studying the sages of the Mishna.. This tour of places associated with the development of the Mishna was our capstone. Because we had many places to see, we entered only two caves. The first cave we entered has been named the “Cave of the Coffins” by the Nature and Parks Authority. When first excavated, this cave held 135 coffins, twenty of which were carved with decorations. Several of these coffins sit in alcoves of the cave, lighted to show off the animals and plant ornamentation. At the far end of this cave a menorah has been carved from the wall. Many menorot have been found in the caves, but this one is the largest, standing 1.9 meters high by 1.25 meters wide, a little over 6 feet by 4 feet. The Parks Authority has worked with the Israel Antiquities Authority to preserve it in situ. Interestingly, Rebbi’s name is not inscribed anywhere in the cave. However, the names of his two sons, Rabbi Shimon and Rabbi Gamliel, are painted in the chamber closest to the door. A stone inscribed with name of the man that Rebbi had appointed head of the Sanhedrin in his stead, Anina the Younger, was also found here. In the back of the cave are two graves dug directly in the ground. No coffin was found, just the two graves, side by side, as might have been prepared for a man and his wife. The graves were originally covered with large stones. The structure of this grave is another bit of evidence that Rebbi was laid to rest here. At the time of his death, Rebbi lived in Tzippori, a larger town about 15 km away. Nonetheless, he left instructions that he be buried in Beit Shearim. He also requested that he not be put in a stone coffin, but be dressed in a simple linen shroud and laid directly in the ground. Today, the custom in Jerusalem is to be buried as Rebbi was—dressed in hand sewn linen shrouds and laid directly in the ground. We exited the cave, and climbed the old worn rock steps up the hill into which the burial cave is carved. We sat on the stone benches of the outdoor classroom for a short class. 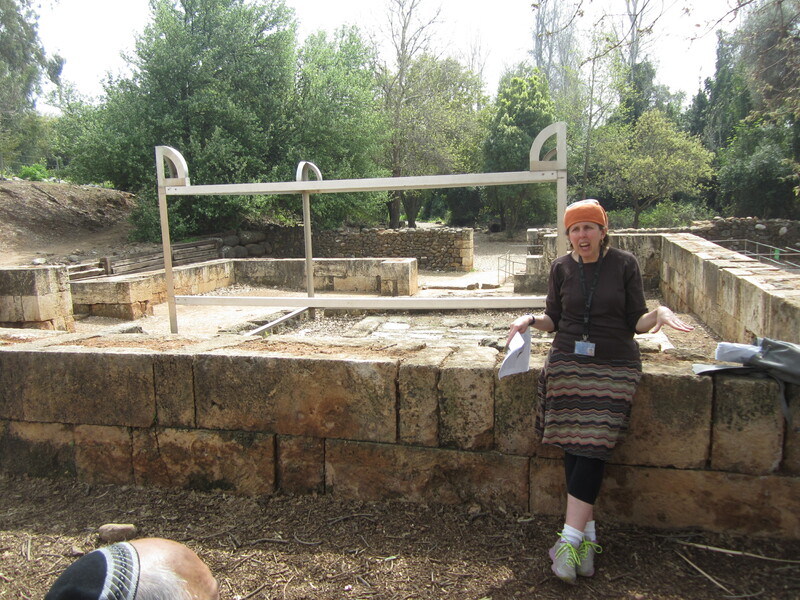 Leah Rosenthal, our teacher, presented an excerpt from the Babylonian Talmud about Rebbi. She joined us on the two day trip to continue the learning we have been doing since last Fall. Our course has focused on the personalities of the Tannaim, as revealed by what was written in the Mishna and in the Gemara. The Gemara is the record of the discussions of the Rabbis about the Mishna. It records their decisions about the halakha, the religious law. Because the Gemara developed simultaneously in the Galil and in Babylonia, there are two versions, known as the Jerusalem Talmud and the Babylonian Talmud. The excerpt Leah chose to learn with us was from the Babylonian Talmud. To start, she pointed out that Rabbi Yehuda haNasi was not the first one to compile texts. Rather, he was the sage who had such stature that his compilation was accepted by everyone. He ushered in a new era. From that time, to this day, all students study the Mishna, as compiled and redacted by Rebbi. The Talmud goes on to illustrate Rebbi’s application of the verse from Psalms. Two students, R. Levi and R. Shimon, disagreed about what to study: Psalms or Proverbs. Rebbi decided to study Psalms. They read the first chapter. When they reached the second verse, Rebbi explained it in his usual way. R. Levi stood up and said, “Rebbi! You have given me the right to rise!” He understood that because he did not desire to study Psalms, he would not learn much from that class. Rather, he would learn more from studying Proverbs, as he had originally wanted. Rebbi, by stating that one can only learn well what his heart, had given him permission to study something else. Sitting at the top of the hill, on the ancient stones, above Rebbi’s grave, we learned some of his work. In those few moments, Leah had brought him to life. As long as students continue to study Mishna and Gemara, the ancient sages remain alive. Looking out at the flowering trees and wildflowers scattered in the grass, we had no desire to go elsewhere to learn. Looking down at a line of simulated Roman attackers from near the top of Yodfat. The Roman camp was in the valley where the bus is parked. Rome. Its name still evokes conquest, power, and empire over 1500 years after its final downfall. Yet the tiny province of Judea fought the mighty empire for more than three years. The Roman legions may have been unstoppable, but the stubborn Jews refused to give up. There were some exceptions; Yosef ben Mattityahu, better known by his Roman name Josephus, was the most famous. Yosef was a Cohen who had worked in the Temple in Jerusalem. In his youth he lived with the ascetic Essene sect in the desert for three years. Later he traveled to Rome and pursued a classical education. On his return to Judea, at the start of the Great Revolt in 66 CE, he was appointed military commander of the Galil. We have few details about his life, beyond what he chose to share in his autobiography. And for political reasons, his autobiography may not have been dedicated to the true facts of his life. What we do know is that as commander of the Galil, Yosef went to Yodfat, called Jotapata by the Romans, to command its defense against the advancing legions. The city of Yodfat stands on a hilltop about 25 kilometers west of the Kinneret (Sea of Galilee). With cliffs on the east side and very steep drops on two other sides, it is accessible only from the north. And even from the north, the climb is steep. Most of the people in my class, including me, were out of breath from climbing part way up the hill to a stopping place. We sat on rocks overlooking the parking lot where our tour bus was parked far below. That valley was where the Romans, under the command of Vespasian, had camped during the brief siege. They didn’t have to put up a tight perimeter wall as they did in other places; geography itself prevented defenders from leaving for supplies. Roman battering ram (replica).The end does look like a ram’s head. looked to the north, towards what would have been the camp of the Roman 15th Legion. About a third of the way up the slope, two rows of long spears and shields stand as if held there by invisible Roman soldiers. Next to where we sat stood a replica of a Roman battering ram. The replica weapons were placed here to give visitors a hint of what the enemy might have looked like to defenders. After conquering the hill, the Romans had destroyed what was up there, and left. The only evidence that remained were traces of foundations, a few mikves, and some cisterns. No one ever built there again. It was not of sufficient strategic value. But this is where Yosef ben Matityahu, and a band of fighters made a stand in 67 CE during the Great Revolt against the Romans. At the beginning of the revolt, Yodfat was one of the towns that was fortified with a surrounding wall. Undeterred by the height of the hill or the city walls at its top, the Romans built a ramp to the top. Their archers and spearmen were able to shoot over the wall. A battering ram damaged the walls themselves. The siege went on for 47 days. It was summer and although they had sufficient food, the town ran out of water. When Yosef instituted water rationing to preserve what little they had, the people complained that knowing they had so little each day made their thirst even worse. And then the Romans broke through the wall. Titus, Vespasian’s son and one of the commanding officers, led the legionnaires into the city, where they killed all the men and captured 1200 women and children. The Romans then razed the city, and burned what was left. Forty of the fighters survived the initial Roman onslaught and retreated to one of the caves that dot the sides of the hill. Yosef proposed that rather than allow themselves to be killed by the Romans, or be captured and taken into slavery, they should take their own lives. They would choose, by lottery, men who would be responsible for killing others. In the end, two would be left. One would kill the other and then kill himself. Maybe Divine Providence helped Yosef that day, maybe it was sheer good luck, or maybe he had somehow rigged the lottery. Whatever it was, Yosef was one of those last two men. Perhaps he had already known when he arrived at Yodfat that the Jewish revolt was doomed to fail. Perhaps he realized it as he looked down on the Romans from the city walls. He does not write about his thinking. It is unclear what happened to the other man, whose name is unknown, but we know Yosef ben Mattityahu, Jewish commander of the north, surrendered to the Romans. Somehow he managed to convince them not to kill him. Being able to write better than the Roman commanders, he suggested they needed an official historian. He offered his services. The captive Jewish general was useful to the Romans. Changing his name to Flavius Josephus, he wrote the history of the Great Revolt, The War of the Jews. This book is almost the only detailed written record we have of the end of the Second Temple period . When we read history, we always ask, how reliable is this author? Does he take an objective stance, or does he have some agenda to promote? In The War of the Jews, Josephus clearly has an agenda—his own survival. He needs to flatter the Roman generals, so they will allow him to live. By the time he writes Antiquities of the Jews many years later, he is no longer worried about his survival, and is somewhat more objective. So should we trust him as a historian? Yes, and no. As Shulie Mishkin often says when referring to Josephus, “When he does not have a reason to lie, he tells the truth.” So when he writes about life in the Second Temple period, or about geography, he is trustworthy. Indeed, many of his observations and comments have been supported by archaeological finds. But when he is talking about war and the Romans, that’s another story. Although Josephus wrote War of the Jews in a way that glorifies Rome and the achievements of her brave legions and its officers, the book nonetheless tells us many details that we would otherwise not know. Even if in doing so, he invented some of those historical details. For example, he reports the speech made by Elazar ben Yair on top of Masada the night before it was captured by the Romans. It was a stirring inspirational speech. Josephus most likely wrote and polished every word himself, since the only survivors at Masada were two women and five children who would not have heard Elazar’s words. I wonder how much of Elazar ben Yair’s speech came from Josephus’ own words to his men at Yodfat. ad been excavated. We walked towards its eastern edge. The drop to the valley far below was breathtaking. It induced thoughts of slipping on a pebble and dropping so fast and far it would take a team of dedicated mountaineers and people being lowered from a helicopter to rescue you. I backed away as quickly—and carefully– as I could. Although two people went even closer to the drop, no one dared standing on the absolute edge. No wonder the defenders of the city felt invulnerable. Unfortunately for them, the Romans had enough men and supplies to make the word “invulnerable” meaningless. When the archaeologists finally came to Yodfat, they found one cistern had been filled with bones. They also found a stone nearby with two drawings carved on it. One was the ancient symbol of a mausoleum, the other a crab, the zodiac sign of the month of Tammuz, the month that the Romans conquered the city. After the Romans left the area, someone had come to Yodfat to take care of the dead, depositing their remains in this one place, and marking it with a memorial stone. Keren Kayemet L’Yisrael, known in the US as the Jewish National Fund, has erected a monument to the defenders of Yodfat at the foot of the hill. Above the story of Yodfat are the two strange symbols. The fight against the Romans may have been futile, but we remember the stubborn fighters who tried to restore Jewish rule to the land. Articles about archaeological finds are not unusual. A relatively large number of archaeologists work in Israel. Given the area’s long history of building, destruction, and rebuilding, it is not surprising to read of important new discoveries. Almost every week the Israeli Antiquities Authority (IAA) announces some amazing find. What is surprising is to learn that this week’s announcement is about something unearthed at the dig you visited less than a week ago. Last Wednesday, Arfan Najar talked to my class about his work at Magdala (Migdal). This week his photo is in the newspaper. He is one of the three supervising archaeologists who found a bronze incense shovel and a jug on the floor of a storehouse near the dock at Magdala. The dock? When we were there last week, he only mentioned the dock in the context of the local fishermen, who brought their catch to the marketplace. He had waved his hand vaguely in the direction of the Kinneret, visible behind him, and said that much of the fish was salted before being sold. Residues of salt had been found in the small pits hollowed out of the stone floor of some of the shops. The IAA does not announce finds until they are authenticated. When Arfan talked to our group last week, he knew about the bronze shovel and the jug but he did not mention them. He knew how important they were. Only ten other incense shovels have been found. But they were easily identifiable because of descriptions in the Bible and Talmud. They are pictured in the mosaics of early synagogues. How hard it must have been for him to refrain from saying anything. He didn’t even hint about recently uncovering something significant. 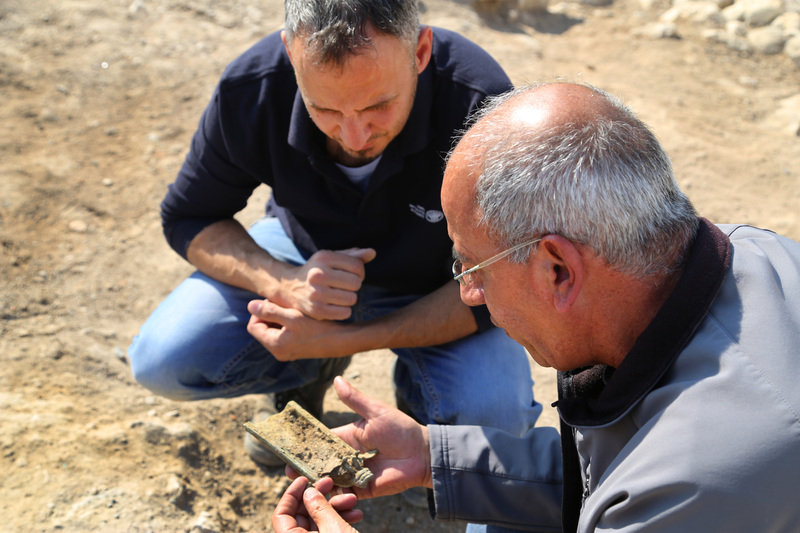 Not even “watch the news for an IAA announcement about our dig.” Arfan described Magdala for us, talking about what they had found with expertise and humor. And all the time, he kept his secret. Archaeologist Arfan Najar at Migdal synagogue. The strange carved stone is behind him. Father Juan Solana was impatient. He had started a project to build a center for religious tourism at Migdal (Magdala). The Legionaries of Christ had bought the land by the Kinneret (Sea of Galilee) and received approvals from national and local authorities. All they needed was certification from the Israel Antiquities Authority (IAA) that nothing of historic value would be disturbed. “When will you finish?” he asked Arfan Najar, one of the supervising archaeologists sent by the IAA in 2009. “Two, three months,” replied Arfan. They would dig a couple trenches, find nothing significant, and leave. Everyone in my class from Pardes on life in the Second Temple Times laughed. We were at Migdal this week to learn about the Great Revolt (66- 70 C.E.) which ended the Second Temple Period. We’ve heard a similar story in several other places. In order to construct something new in Israel, the builder must obtain a permit from the IAA. Thinking there is nothing interesting at the site, the IAA sends a relatively unknown archaeologist to conduct a salvage dig. A salvage dig, the archaeologist reassures the builder, doesn’t take too long. He digs for two months, maybe three. Then he writes his report that there’s nothing important at the site, and the permit is issued. But once in a while the archaeologist finds something interesting, something of historical significance and the dig continues for years. Some of the most important recent archaeological finds have come out of salvage digs. These include findings from the Givati parking lot and the Kishle in Jerusalem. That’s what happened at Migdal. Replica of the Magdala stone, on display at the Migdal synagogue. The menorah with oil jugs to each side of it can be seen on the end. The original stone is in the IAA storehouse. Arfan and Dina Avshalom-Gorni, the other supervising archaeologist, and their team started digging a trench. They dug through the earth about a foot and a half and found a large rectangular stone. As they brushed the dirt from the stone, they became more and more excited. It is about the size of a large foot stool, and has short legs. The four sides and the top are intricately carved with incised religious symbols from the Second Temple era. Within two months the archaeologists had unearthed parts of walls of what looked to be a decent sized building. The salvage dig was extended, and then became a full-fledged archaeological dig sponsored by Anahuac University of Mexico, the National Autonomous University of Mexico, and the IAA. The building they unearthed is a synagogue, dating from the first century. Because a few coins were discovered in the foundation, the archaeologists know that the building was built about 30 years BCE. In 67 CE, when the Romans conquered Magdala during the Great Revolt, they destroyed the whole city. However, this building was not buried in rubble of its upper layers. Here, at the edge of the city, no destruction layer was found. The foundations, lower walls, mosaic floor, and the mysterious stone remained intact under a layer of earth for almost two thousand years. Magdala had been built by the Romans as an administrative and commercial center for the whole Galil and served that purpose for years. The Temple in Jerusalem still stood; it was the religious center for the country. Very few synagogues existed at the time—there was no need. In 2009, when Najar and Gorni started digging, only six synagogues had been found in the whole country dating from the Second Temple period, all in the south. The only evidence of synagogues in the north came from the Christian Bible, in the stories of Jesus’ preaching. Magdala was the first Galilean synagogue to be discovered. Like the other synagogues of the time, it is built with stone benches on its perimeter, and faces Jerusalem. The floor is decorated with a black and white mosaic in a geometric design, which reflects the great wealth of the community. Since all the pieces of the support columns have been found, the archaeologists know the ceiling was about three meters high. The main room was large enough to hold 120 people. Two small rooms on the southern side had shelves and were most likely to have held Torah scrolls. Herod, the great builder of Caesaria, Masada, Herodyon, and the Temple, was also a great despot. He managed to hold on to the Roman province of Judea and keep everything under control. The Judean kings who came after him were not so strong, and became puppets of Rome. The real power was held by the Roman procurators, who tried to extract ever more taxes from the country. The Jews were not going to tolerate so much Roman interference and they rebelled. The Great Revolt of the Jews started in the Galil and spread south to Jerusalem. Magdala is built on the flat land between the Kinneret and the cliffs of Arbel, just north of Tiberius. It had no natural defenses. Joseph ben Mattityahu, better known by his Roman name Josephus, was the Jewish commander of the Galilee. He ordered a wall be built around the city. The Jews of the city realized it would fall to the Romans. They did not want the synagogue desecrated so they decided to carefully dismantle it. The stones of the upper walls and the top two-thirds of the columns that supported the roof were used to build the defensive wall. The bottom third of the walls and the furnishings, including the Stone, were then covered by a thick layer of earth. They were holy and would not be subject to destruction—the layer of earth would protect them. And protect them it did, until two thousand years later an Arab and a Jewish archaeologist dug and swept it away. Magdala is a town of significance to Christians because of its association with the life of Jesus. Mary Magdalene (Mary from Magdala) may even have been the wife of Jesus, according to a minority interpretation of scripture. This association is what brought Father Solana here. He wanted to build a hotel to house religious pilgrims and a spiritual center that would be open to all faiths. The spiritual center, called Duc in Altum, has already been built close to the Western shore of the Kinneret. The synagogue was found where the hotel was supposed to be built. After being redesigned, construction has finally started. As Arjan told us about the excavation, he occasionally had to stop speaking for a moment or two because he could not be heard over the construction noise. The new design incorporates the synagogue and other elements of the ancient city into the hotel. One wall of the lobby will be glass, offering hotel guests a close view of the ancient synagogue. A wing of the hotel is built right up to the eastern side of the synagogue. Up to now it has been thought that early synagogues played a different role than today’s synagogues do. The word for synagogue in Hebrew is Beit Knesset, House of Gathering. People came here to meet friends, study Torah, and attend community meetings. Communication with God was through sacrifice at the Temple in Jerusalem. The synagogue only became a Beit Tefila, a House of Prayer, after the destruction of the Temple, when people had to find a new way of communicating with God. The Magdala stone may have served as a resting place for scrolls, such as a Torah scroll. It is the right height for a seated person to read. Or perhaps it was a reminder of the Temple, designed to give the building an aura of holiness. Many of the incised designs—the menorah, the table, the oil jugs, the arches—are fixtures or architectural elements of the Temple. The rosette design on the top of the stone might be a reminder of the heavenly chariot, as described by Ezekiel. One thing is sure—it was found in the oldest synagogue ever discovered (so far). For many years the town of Migdal, ancient Magdala, was of interest only to Christian pilgrims. Thanks to a Catholic priest’s desire to build a spiritual center, and the work of both a Muslim and a Jewish archaeologist, one of the earliest synagogues has been discovered. As more artifacts of life in first century Galilee are uncovered, it may well become a site of interest to more Jews as well. Tsfat is one of the four holy cities of Israel. It is the old city of the mystics and the new city of Bar Ilan University Medical School. Spelled Zefad by Google maps and Safed in history books, it is built on the steep hills in the heart of the mountains of the Galil. Stairways are everywhere. “That’s the nearest place to buy food,” she said.”There are no makollets in the Breslov area.”I grimaced at the idea of pushing, dragging, lifting, all my groceries along with a baby and toddler in tow, up and down all those stairs. The stairs were the standard limestone stairs you see all over Jerusalem , the kind that get very slippery when they are wet. “What about winter?” I asked. That day Miri and I walked the perimeter of the Breslov enclave–down the steps and along a flat street that gave magnificent views of the forested slopes of the Galilee Mountains to Mount Meron on the other side of the valley. At the far end of the Breslov enclave, we climbed back up to the main area of the city. Last week, however, I got to enter the Breslov area. On a trip to Tsfat with my class on prayer, we met with Rabbi Simcha Mirvis. Rabbi Mirvis, who originally hails from Nashville, TN, welcomed forty of us into his home. When he realized how large our group was, he sent to neighbors for more chairs, apologizing for his wife’s absence. They had just welcomed a new baby and she was spending time at a special rest home for new mothers. The Breslov sect, followers of Rabbi Nachman of Breslov (1772-1810), are known for several things: their joy and their practice of hitbod’didut (seclusion). Their joy is expressed by wild, psychedelic painting on the trucks that show up at celebrations playing loud music for everyone to dance to. The young men race into crowds of onlookers or soldiers, grabbing hands to pull men into their circles. One subgroup of the Breslov Hasidim is known as “Na Nachs,” because of the slogan they paint on any, and all, available walls, and rocks, as well as their sound trucks. All over the country you see the phrase in Hebrew “Na Nach Nachma Nachman m’Uman.” This slogan, which is simply Rav Nachman’s name spelled out one syllable at a time, was revealed by the Rabbi 112 years after his death in a note to one of his followers. The Na Nachs believe these words form the ninth of the Ten Songs of Redemption. I’ve seen “Na Nach Nachma Nachman m’Uman” on stickers plastered to cars and apartment doors, and painted on abandoned buildings, fences around construction sites, and large rocks in national parks. The retaining wall of Har Menuchot, one of the largest cemeteries in Jerusalem, is clearly visible from Road 1. Riding on a bus one day, I looked up and saw “Na Nach N” in bright red and purple letters on that wall. How horrible, to see that outside the resting place of your loved ones! A few days later, the letters had been covered with paint that almost matched the color of the stones. Since then, no one else has deface the cemetery wall. However, you can still see the whiteness of the covering paint, however. My class on prayer was not in the Tsfat Breslov enclave to discuss red and purple paint, but to learn more about hitbod’didut, the distinctive spiritual practice of Breslovers. Hitbod’didut, which means seclusion, is freestyle personal prayer. The Breslov Hassidim go to quiet, secluded places, preferably a field or forest, and talk privately to G-d. Unlike meditation, it is performed aloud. Ideally, according to Rav Nachman’s formulation, it should be done for at least an hour a day, in the middle of the night or early morning when all is quiet and there are no distractions. Rabbi Mirvis said that sometimes, like this week, he can’t get away from the house, so he sits in the corner of his living room and does his hitbod’didut there. In Tsfat, many of the Breslov men go out in the middle of the night in small groups of three or four. They drive a few minutes out of town into the mountains. Each man goes his own way to find a suitable place to talk to G-d, arranging a time to meet back at the car. If someone does not show up, the others know to go look for him. Rabbi Mirvis says you can tell a Breslover by his shoes. Most Hassidim wear wing-tip shoes, or perhaps Yeshiva-style loafers. But Breslovers wear boots, so they can hike through the mountains or trek through fields. The ideal is to show up for morning prayers at 6 AM with fresh mud on your boots. The others will look at you and think, with admiration, “he’s been doing his hitbod’didut.” I was amused to hear that these Hassidim, who dress modestly to avoid attracting undue attention to the externals, might check each other out that way. When he finished his explanation, he asked if there were any questions. Someone else asked the question I wanted to—what do you talk about in hitbod’didut? “And if you can’t go out to nature, it’s okay to do it at home?”someone else asked. Then he added that women, with more responsibilities in the house, tend to do their talking to G-d at home, in small snatches of time during the day. They should also set aside time, but the small snippets of time are very powerful because the women are constantly in touch with G-d. Hitbod’didut doesn’t have to be about issues of supreme importance, it can be as simple as, “Please don’t let the cake fall in the oven,” or “Help me not to lose my temper with my four year old this morning.” The important thing is that is spontaneous, rooted in the here and now, yet strengthening your own path between you and G-d.
Having grown up in the mainstream of Jewish tradition, in which all prayer is strictly rooted in the words of the siddur, the prayer book, hitbod’didut was a refreshing idea. In a way it validated what I have been doing all my life, talking to G-d several times a day, as the need arises. These little snatches of prayer are in addition to my daily prayers, which I recite at the specified time. Unlike Rav Nachman and the Breslov Hasidim, however, I don’t go out to the fields or forest to do it. Maybe one day I will. Springtime in the Hazor Valley, looking towards the mountains of the Galil from the tel. The story of Biblical Hazor starts in the Book of Joshua. The Israelites had conquered the Canaanites in the south of the country, from Kadesh-Barnea to Gaza. “And it happened that Jabin King of Hazor heard” (Joshua 11: 1). He sent messages to all the other kings in the north, who gathered with their armies to fight the Israelites. But with G-d’s help, the Israelites won the battle. Joshua then captured Hazor, which had been the leading army of the Canaanite forces, and burned it. .
Allen and I visited Hazor as part of my Tour with Text course. We had been studying the first book of Kings since the end of October. Three weeks studying a section of the text were coupled with a bus tour to see how the story played out against its geographic background. On our last trip we went to the Galil, to the northern part of the country to see cities Ahab, King of Israel, had built or fortified. Hazor was our last stop. After ascending the tel, we entered the ancient city through a six-chambered gate. By this time, everyone in our group recognized its significance. Although most cities of the time had four rooms in their gates, three cities built by Solomon had six rooms: Gezer, Megiddo, and Hazor. These three gates are mentioned in Kings (9:15). Today, the only ancient cities in which Israelite six-chambered gates have been found are these three from the Kingdom of Israel and Lachish, which was in the Kingdom of Judea. We entered a large Canaanite structure, which is thought to have been the palace of the Canaanite kings. The entrance is flanked by two stone columns, as was common among many of the earlier cities of the area. These columns reminded me of the columns between which the Philistines chained Samson, much to their regret. The foundation of the building is stone and above the stone the walls are mud brick. At one time, a strip of wood lay between the layers of stone and brick. Now wood ash sits in that space. That wood ash is evidence of a terrible fire that burned the city in the 13th century BCE, around the time Joshua was leading tribes of Israel in their conquest of the land. In front of this structure is a large bamah, a high place or altar used for religious purposes. A large statue of Ba’al was found here, decapitated. Decapitated statues of gods are signs of religious wars. When the god of a place is unable to protect it, its worshipers lose. The winners then destroy god the losers had worshiped. In our travels around the country we have seen the remains of many stone and mud brick buildings, but this was the first time we had seen such detailed evidence of the Israelite conquest. The soot that has marked the stones and brick for over 3200 years is a direct link to our past. Joshua and the Jews who came out of the desert into the land become more real to me with every bit of evidence I see. Hazor did not just suddenly spring up in Joshua’s path. At that time it had already been an important Canaanite city for over 500 years. It occupies a strategic location at the eastern end of the Via Maris, the route near the coast used by ancient traders and armies moving between Egypt and Mesopotamia. Besides being mentioned in the Bible, it is referred to in the Egyptian El Amarna letters and stela. To the north, the archives at Mari, a Babylonian city along the Euphrates River, also mention Hazor. Strategic sites retain their importance no matter who rules the area. After each conquest, sooner or later, destroyed cities are rebuilt by new rulers. That’s how tels develop, as each new city is built on top of the ruins of the previous ones, until a small hill along a trade route becomes a prominent height overlooking much of the route’s length, or even a whole valley. Historic periods often mingle on a tel, as the basement of a later structure is dug down into the main room of a an earlier one. At Hazor, we saw that the middle chamber of one side of the gate rests on black stone. The stone is basalt; Solomon’s gate was built atop the threshold of a basalt Canaanite temple. Or building stones in good condition become incorporated into later walls. At Hazor, this secondary use of materials is evident in several places. The midsection of an Egyptian basalt statue of a lioness became the door jamb of an Israelite house. Such secondary use of materials and intermingling of historical periods is not restricted to the ancients; we see it in Jerusalem today. Today’s Damascus Gate into the Old City, built by Suleiman the Magnificent in the 16th century stand on the remains of the Roman gate and the rooms where the Roman guards rested between their shifts. Under the Hurva synagogue, paving stones of a Byzantine era street partially cover an even older mikve, a ritual bath from the Second Temple period. Hazor was a large city under King Solomon, and King Ahab enlarged it. But it never again reached the size it had been when the Canaanites controlled it. Then it had been a huge city with an estimated population of about 15,000. Although it was smaller when rebuilt, nonetheless archaeologists have found several large buildings, temples, granaries, and city walls and gates dating from the time of King Ahab. The site is the largest tel in Israel and it has not been excavated completely Archaeologists still hope to find a Canaanite or Israelite archive. which stood many upright stones of various sizes. A standing stone is called a matzevah, or monument, and differs from an altar, or mizbe’ach, in that an altar is built of many stones. Today, matzevot are erected as small memorials to an event or used as tombstones, but in earlier times they had sacred purposes. For example, the temple on Tel Arad contains a matzevah within its holy of holies. These were acceptable in early Jewish history, but later were much less so. be close to the city. Many of the most strategic locations for cities were on hilltops, but the nearest water source was in the valley. For many cities, such as Jerusalem, Megiddo, and Hazor, this situation caused a large problem in time of war. One solution to this problem was to build a tunnel that starts inside the city walls so the people could retrieve water without exposing themselves to the enemy. The tunnel and wall around the water source also protected it from being captured or used by the enemy. We’ve walked through such tunnels in Jerusalem, and at Megiddo and Tel Sheva. In Hazor, we stood at the top of the shaft and looked down. It was late afternoon on a very hot day, and no one had the energy to descend hundreds of metal stairs into the water tunnel, no matter how cool it promised to be in there. The walk back up would not have been worth the effort. Instead, we slowly walked down the path on which we had ascended the hill, admiring the view of the Hazor Valley. Tsfat is said to have been settled in the time of the First Temple. Jews supposedly lived here in the Second Temple period as well. Unfortunately, there is little evidence supporting either claim, because the city has been destroyed by earthquakes every 100 to 200 years. There is almost nothing truly ancient here. Even the Old City, with its old architecture and obviously renovated buildings is not very old by Israeli standards—most buildings were constructed after the 1837 earthquake. Besides the lack of street names, there is the problem of building numbers, which are not always consecutive or posted on the buildings. And the streets themselves, which may look car-friendly at one end, tend to narrow and wind, and quickly become impassable for any vehicle wider than a donkey cart. That is, the streets that don’t end as stairways. The Breslov neighborhood, which is relatively new, seems to be all stairs, and it looks like many stairways lead to only one door, which means if you go up the wrong one, you have to go back down and then up a different set. Supposedly there are passages between apartments that people who live there know about. All I could think about was trying to take the groceries home, up and down all those stairs, pushing a baby buggy and holding a toddler’s hand. And since Breslovers have large families, that is not an unlikely scenario. The most famous set of stairs in the city is the large broad stairway built by the British to separate the Arab and Jewish neighborhoods after the 1929 Arab riots. These stairs go up and up and up, over 100 steps from the lower part of the city to the main street. At several points they widen into a landing where a road cuts across them. Just going from the level of the artists’ colony in the Old City up to the main street made me out of breath. Walking down from the main street to a level below the artists’ colony made my thighs ache. People who live Tsfat develop strong leg muscles. Tsfat is known as the city of mystics. Kabbalism flourished in the 16th century, when many of the great Kabbalists lived and studied here. Rabbi Isaac Luria, better known as the Ari HaKadosh, is one of the best known. He is called the Ari because it is the acronym for the “Ashkenazi Rabbi Isaac,” but the name also means the Holy Lion. Although the Ari was born in Jerusalem, he spent most of his formative years in Egypt, and moved to Tsfat in 1570. He lived and taught here for the last two years of his life, but in that short time he changed the city and Judaism itself. Some of the customs he instituted we still follow today. For example, he compiled the prayers welcoming Shabbat, taking his followers out to an open area at sunset where they recited a Psalm for each day of the week. The service culminated when they turned to the West and welcomed the bride, the Queen Shabbat. Today, Jews around the world still sing L’cha dodi, a beautiful hymn which ends with the words “Come, oh Bride; Come, oh Bride” which was written by Rabbi Shlomo HaLevi Alkabetz. The Ari did not write much himself; most of teachings came down to us because his student, Rabbi Chaim Vital, wrote them out. But such is his reputation that several of the most holy places in Tsfat bear his name. These places are not memorials to the Ari, but are in daily use today. The Ari mikve (ritual bath) is near the base of one of the mountains on the edge of the city. The hill going down to it is very steep, and the road curves past the cemetery. Because it uses water from a mountain spring, the water is icy cold. One of my friends tells of going there with friends when they were yeshiva students forty years ago. As they were dipping in the mikve, an older man rushed in and yelled at them to get out of the water immediately. The three naked boys scrambled for their clothes and before they had time to get fully dressed, four men came in carrying a dead man on a stretcher. The boys watched in shock as the men performed the tahara, the ritual washing of the dead before burial. Although today the Ari mikve is no longer used for taharas of the dead, he said that in all the years since that incident, he has never been tempted to revisit it, even when he is spending Shabbat in Tsfat. But others do use the mikve for ritual purification. Some Birthright groups visit Tsfat and the young men dip themselves in the mikve. They tell us that going to the Ari mikve is one of the highlights of their trip. The heritage of the Ari is also claimed by two synagogues, one Sephardi and Ashkenazi. The original Ashkenazi synagogue where the Ari prayed, on the edge of the Old City, was destroyed in the 1837 earthquake. Twenty years later a new building was erected on the same site. It has a raised platform in the middle of the room for the Torah reading, and an arched ceiling. It also has an elaborately carved and painted olive wood aron kodesh where the Torah scrolls are kept. Unfortunately, someone sent inaccurate measurements to the German workshop where it was made. When the aron arrived at the synagogue, it was too tall to fit into the niche reserved for it. The top section, therefore, tilts forward. In the center of the tilted section sits a lion with the face of the Ari HaKadosh. In the heart of the artists’ colony in the Old City is a Sephardi synagogue, built where it is believed Rabbi Joseph Karo studied in the early 16th century. Rabbi Karo compiled the first widely published code of Jewish law, the Shulchan Aruch or The Set Table. Today the Shulchan Aruch is still the definitive guide for observant Jews. Like most of Kabbalists in medieval Tsfat, Karo was Sephardi. He came to Tsfat from Turkey, where his family had lived since the 1492 expulsion from Spain. His book details the Sephardi way of observing the laws, so later Rabbi Moses Isserles wrote Mappah, The Tablecloth, explaining where the Ashkenazi tradition differs. Many editions of the Shulchan Aruch print Karo’s original text in regular Hebrew letters, with Isserles’ additions in Rashi script, which would be equivalent to showing the text in a regular font and the additions in a cursive one. When we visited the synagogue, we entered through a door whose sign indicated we were entering a yeshiva. When we went in, however, we were in a store selling tourist merchandise. We walked through the store, watched by the storekeeper, through a small door into a beautiful synagogue. In 1948, when the building was the home of the Chief Rabbi of Tsfat, this room was his library. One wall is still lined with glass-fronted bookcases. We could tell it is a Sephardi synagogue by the way the benches are arranged: in a square against the walls. The benches all have long blue cushions on them and face towards the raised platform in the middle where the Torah is read on Shabbat and holidays. The two small Torahs on the platform’s railing are in wooden cases, as is the custom of the Sephardim. The ark in which the Torahs are kept is on the southern wall, the direction of Jerusalem. The room is plain, the only decorations being tall bookcases, a few prayer plaques on the walls, and the colorful lamps hanging from the ceiling. The ceiling is painted blue. A heavy curtain hangs at one end of the room, opposite the windows. This is the section designated for the women, the ezrat nashim. Several of us went through the curtain to look at it. Unlike the men’s section, the ezrat nashim has thickly upholstered chairs and wide divans. The women who pray in this synagogue might sit in comfort, but they are blind to what is going on. Despite the cushy seats, I still prefer to pray where I can see and feel more a part of the congregation. Allen and I went to Tel Dan with my class on Kings I to see one of the religious centers for the people of the Kingdom of Israel. After the death of Solomon, the Davidic kingdom was split in two. His son Rehavam ruled Judea in the south and Yeravam I (Jeroboam) ruled Israel in the North. Yeravam established two cultic centers to keep the people in Israel from returning to Jerusalem to pray at the Temple. One of the cultic centers, with a golden calf and an altar, was built in the city of Dan, which sat on high place along the Dan River. For most of the year, rivers in Israel are small sluggish streams. But we were at Tel Dan in late March, at the end of a winter of good rain, and the Dan River was noisily rushing. We walked along the river for some distance and I was amazed. It was the first time I had ever seen a rushing stream, flowing through woodlands, in all my time in Israel. It felt more like the Appalachian mountains of Pennsylvania than the foothills of the Mount Hermon. The Dan rises from the largest karstic spring in the Middle East, in the highlands of the northern Galil. Even in dry years it has a decent flow–approximately 230 million cubic meters a year. That’s close to 608,000 gallons, enough water to supply six average American households for a year. The Dan joins the Banias and Hasbani Rivers to form the Jordan just north of the Hula Lake. The Jordan then drops below sea level to flow into Lake Kinneret (Sea of Galilee). It remains below sea level for the rest of its length, down the rift valley into the Dead Sea. The city of Dan has a long history. It was built on the site of the earlier city of La’ish. La’ish or Dan is mentioned several times in the Bible, in the books of Joshua and Judges, as well as in Kings. After 1948 Tel Dan was within Israel, on the Syrian border. Because of the danger of Syrian attack, archeologists did not explore the site. But in 1966 people who lived in the area noticed the IDF digging defensive trenches near the Dan River. They called the archeology department at Tel Aviv University and notified them, pointing out that the IDF did not care about antiquities. If the past was to be uncovered and saved, some trained archeologists needed to come north quickly. Avraham Aviram organized the 1966 excavation and continued to explore the archaeological site at Tel Dan for the next 40 years, until his death. Even today, we do not know exactly how large the city was at its peak. Dan was probably not a government center, but it was an important city on the border, and a cultic center. But excavations are continuing, and the city’s borders may yet be discovered. Even without knowing the city’s size, we have learned many fascinating things from the digs here. In one spot, a deep pit reveals the first layer of the city, from the era of settlement in the time of Joshua, about 1400 BCE. Part of a victory stela (inscribed stone slab) was also found, carved in ancient script. The stela dates from about 50 years after King David (around 850 BCE). Although much of the inscription is missing, what remains is significant. On the stele, the King of Aram boasts of having beaten the armies of his two southern neighbors, and killing the kings of Israel and Judea. According to current thought, the stele celebrates the victory of Hazael of Damascus over King Jehoram of Israel and King Ahaziah of Judah. What makes the stele important is that is the first written reference to the Davidic dynasty outside the Bible. The major importance of Dan lies in its role a cultic center. Cultic centers tend to retain their holiness even when the governing culture and religion change. For example, the Temple Mount, has successively housed the Jewish Temple, a Roman temple, a mosque, a church, and today another mosque. At Megiddo, several different types of altars have been found in one small area. Tel Sheva, and the Israel Museum. It stands within a square courtyard, surrounded by small rooms whose function is unknown. Perhaps the small rooms were where the sacrifices were prepared. Or maybe the priests changed their clothes in them. On one side of the altar complex are earthworks and stone steps on which the people probably stood to watch sacrifices. It is also on the east end of the tel, as altars were in those days. From the high place we turned and walked south to the Israelite period gate. Like many remains from ancient times, the gate shows an amalgam of history. Part of what can be seen today is the original gate and part of it is from King Ahav’s rebuilding (both from First Temple period). Part of the gate dates from the Greek (Second Temple) period. Gates were significant places in earlier time. Much of the life of the city occurred here. They were a major site for commerce—we read of Abraham buying the Cave of Machpelah at the Hevron city gate. This is where the Judges and elders sat, as we read in the Book of Ruth. Traders conducted their business at the city gates. As evidenced by a small altar nearby, gates were also religious sites. Travelers could offer a small sacrifice to thank the city’s god for bringing them safely to their destination. From the Israelite gate we walked downhill and to the east until we arrived at the older Canaanite gate. This section of the archaeological site was discovered only ten years ago. It was identified as being of Canaanite origin from two characteristics. It is outside the Israelite gate. It is built of the Canaanite mud bricks common in the 18th century BCE. When the Israelites built their gate, they filled in the opening of this one because it was no longer needed. Thus it was preserved through the centuries of earthquakes and neglect. The most remarkable thing about the Canaanite gate is its shape. It is an arch. Until this gate was discovered, intact, many people thought the Romans invented the arch. (The Romans may have learned about arches from the Etruscans.) But here at Tel Dan, stands an arch built between 1550 and 1800 years before the earliest Roman one. 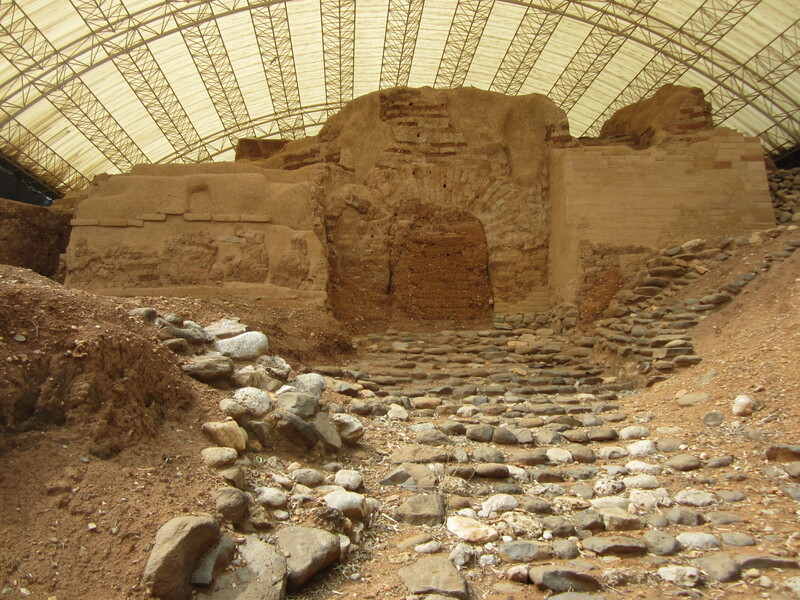 Canaanite arches had previously been found in Ashkelon and Gezer, but the Dan gate is the first complete arch that has been found. In unearthing the past of this land, archaeologists are changing our understanding of the past as well. History does not remain static. In walking the land, our conception of the past continuously changes. The three most important factors in valuing real estate, as any realtor advises, are location, location, and location. It’s not a recent phenomenon; the ancients knew it as well. The most important thing to consider before building a city was proximity to a source of fresh water. Additionally, from the site, they had to be able to see people approaching from a distance, so overlooking a valley was good. And if that valley was trade route, all the better. Megiddo meets all these criteria, which is why it was almost continuously inhabited for over 4000 years, from the Neolithic period (about 6000 – 7000 BCE) to the end of the Israelite period in 732 BCE. For much of its history, Megiddo overlooked one of the major trade routes in the Middle East. The two big powers in the area were traditionally Egypt to the southwest and the Hittites, Assyria, and Babylonia. The Hittites, Assyrians, and Babylonians were ascendant during different periods, and held different territories, but they were all to the northeast. They used the land bridge along the Mediterranean to wage war against Egypt. Commerce between the east and west was conducted on two north-south routes: the Via Maris (sea route) near the coast or the Kings Way, along the Jordan River Valley. The best way to get from one of these routes to the other was through the wide flat Jezreel Valley, in the Galil. And overlooking the Jezreel Valley sits Megiddo, with its own water supply, in a spectacularly beautiful location. Because of its strategic location, it had both economic and military significance. Thus, many battles have been fought here. It is the site of one of the earliest battles in recorded history , when Pharaoh won a decisive victory in the 14th century BCE. The Bible reports Deborah and Barak beat Sisera at Mount Tavor on the other side of the valley (Judges 4-5). King Saul fell in battle against the Philistines on Mount Gilboa (Samuel I: 31). General Allenby beat the Turks and Germans here; when knighted by the King of England, he chose Viscount Megiddo as his title. And according to Christian tradition, the last battle at the End of Days will occur here. It doesn’t take much of an accent make Har Megiddo sound like Armageddon. With all that history, it has lured multiple archaeologists to its heights. In the 14th century, this particular hill at the edge of the Jezreel Valley was identified as the site of a Roman army camp. But it was not identified as Biblical Megiddo until the mid 19th century. The first modern excavations took place under the auspices of the German Society for Oriental Research (1903 – 1905). Gottlieb Shumacher, the expedition’s leader, discovered a palace and tombs from around 1000 to 2000 BCE. This gate is one of the pieces of evidence in a long controversy in interpretation of archaeology. One of the biggest questions still outstanding is the nature of the Israelite kingdom. Were David and Solomon rulers of a large kingdom or were they small tribal chieftains? How literally should we take the Bible? Yigal Yadin, a famous military leader and archaeologist of Israel’s early years, is famous for his work on the Dead Seas Scrolls. He also excavated at Masada, Hatzor, and here at Megiddo. He notes that six chambered gates have been found at Hatzor and Gezer, cities dating from the time of Solomon. Thus, the similar gate at Megiddo is evidence that it also dates from Solomon’s time. The inner gate is evidence that Solomon’s kingdom was large. Because the foundations of the gate rest within earlier layers of the tel, it is hard to date them exactly. They could have been built during the same period as the palace, or from the same period as the stables, several hundred years later. David Feinstein, from Tel Aviv University, holds that the gate is not from the early period. Rather, it is part of the building done at Megiddo later, in the period of King Ahav. top, clearly not used by Jews to sacrifice to G-d. No square Jewish altar with horns, with a ramp leading to the top, has been found here, not even from pre-Temple times. On the other side of the cultic area is an open trench, dug down to bedrock. It was left exposed to show the 30 layers of civilization built up here over the centuries. I could see several layers, identifiable by the different shades of beige and brown/ However, I could not count all of them. Either my color discrimination or my appreciation of archaeological details is deficient. It’s enough for me to know that that those who do appreciate the subtleties can count them. We then walked across the site to the stable area. The stables are also used as evidence in the dating controversy. If the palace at Megiddo is from the time of King Solomon, as Yadin believed, then the stables were built by King Ahav. But if, as Feinstein claims, the palace was built by King Ahav, then the stables date from King Yeravam II. Today the stables are easily identifiable—black iron horses stand in several spots. But when it was being excavated, the experts were not sure what it was. One day a college aged volunteer mentioned that she was working in the stables. The veteran archaeologist told her she should not say that; they were not yet sure what the area had been used for. The stone troughs could have been used for other purposes, such as kneading troughs in a large communal bakery. The archaeologists looked more carefully at the marks. The young inexperienced volunteer was right. They set the troughs in rows between the stone posts, which they now realized the horses had been tied to. Later someone added the wrought iron horse silhouettes to the area. Now visitors who can’t identify horse teeth marks or kneading troughs can easily see what the area once was. No city can exist without a source of fresh water, but so far we had not seen any water on the tel. We walked towards the south and came to a large open pit, 25 meters (82 feet) deep, with steel stairs winding down around its inner edge. We’ve been to enough Biblical sites to know what we were looking at. This was the access within the city walls to the source of water located outside the city walls. The steps are narrow and the descent steep. But it was only 183 steps down and 80 back up at the other end, according to the sign at the top, and most of us still had energy left. Besides, it was hot. Walking through the ancient stone tunnel was bound to be cooler than walking back down the path we had taken to the top of the tel. As we entered the stone tunnel itself, a few people made expected comments about the “original Israelite period electric lights.” We walked through the tunnel on a boardwalk, built to allow tourists a safe path above the rough stone floor. The original chisel marks on the walls and ceiling were easily visible. This tunnel, like the access tunnels to the water sources in Jerusalem, Tel Sheva, and Hatzor, had been dug out by hand, by men using chisels and hammers. It would have been slow painstaking work, a few inches a day, through the solid bedrock. But it enabled the cities to survive for hundreds of years, withstanding sieges and droughts. The only water in the tunnel today stands in a small pool at the far end. Over the centuries the water has found new paths. Earthquakes changed the original outlets. Debris has blocked feeder channels. New settlements and cities have tapped upstream sources. None of these factors, however, changes the achievement of the ancient engineers and builders, who managed, without today’s science or technology, to build the water tunnels. As I took a sip of water from my bottle after emerging from the tunnel, I once again marveled at the ingenuity and ability of the ancients to provide for their needs.